It’s a great all round house and pot plant. 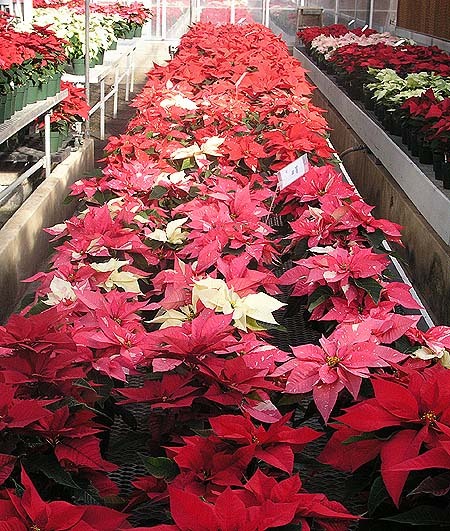 Poinsettias (Euphorbia pulcherrima) are ‘THE’ plant for the holiday season. Their bright red, pink or white flowers bring color and cheer to the home. Some Poinsettias can be huge and give a lot of ‘bang for the buck’ The make great centerpieces, table decorations or even placed on the floor. However after the holiday season is over most Poinsettias end up in the garbage bin. This is a very sad end to such a wonderful plant. To begin with if you buy a good poinsettia from a reliable source then the color in the plant can last all the way through winter. Don’t throw it away if its still adding color and brightness to your home. If cared for Poinsettias can last for years and years as house plants and be placed outside during the summer months. They make wonderful green plants and are very easy to care for. BUY FROM A GOOD SOURCE . Choose your source wisely. 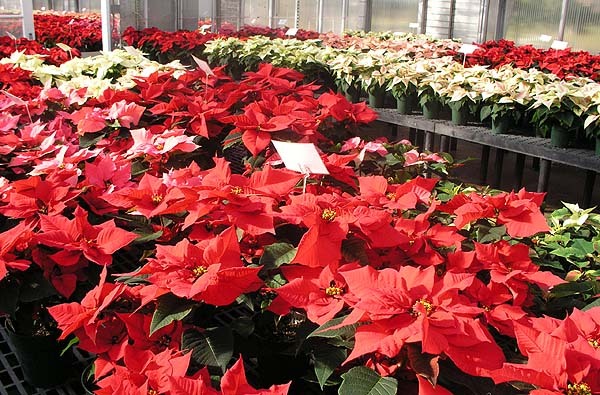 Many garden centers have wonderful poinsettias during the holiday season and they are usually well cared for. Plants offered at supermarkets, big box stores or roadside stands often have poorer quality plants or ones that have not been cared for properly. Portion of the Poinsettia trials at Rutgers University. TAKE CARE WHEN BUYING AND TRANSPORTING YOUR PLANT. Poinsettias are semi tropical plants. They grow well outdoors in places like southern Florida and Hawaii. They don’t like the cold. IF a poinsettia gets cold, even for a short time it will suffer and it wont last well. This is why it is extremely important to make sure you buy from a good source. One that has ensured that the plants are well cared for, that they are kept warm and don’t get any sudden cold shocks. With big box stores plants are often loaded onto rolling carts (we have all seen them) then maybe left on the loading dock or the unheated stockroom for hours before they are brought in and placed on display. These plants can loose their leaves quite fast and will not last during past the holiday season if they last that long. When purchasing make sure that the plant you choose is not located near a entranceway where it will be subjected to cold breezes when the doors open and close. This can be detrimental to the plant. If you do want to keep your plant alive and well, picking one that has been dyed blue or covered in glitter is not a good choice. These poor plants are already subjected to a lot of stress. Glitter is going to badly affect the way the plant can make food and energy. It might look good but its not good for the plant. Once you have your plant get it home quickly. If it’s cold make sure the plant is wrapped in a bag to protect it on its journey to the car. Don’t leave it in an unheated car for any length of time. 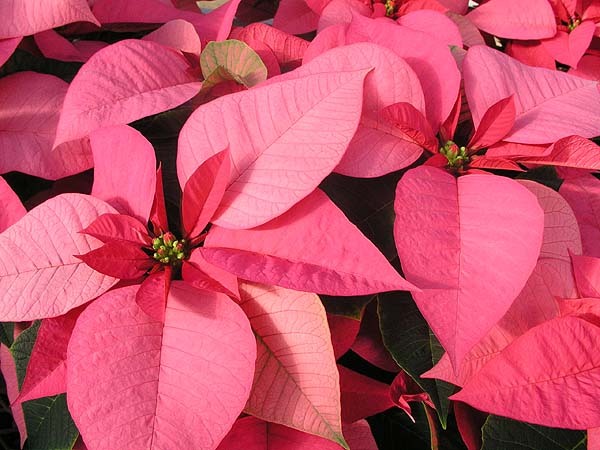 Luscious Pink Poinsettia. Part of the Rutgers Trials. PLACING YOUR PLANTS IN THE HOME. For short periods of them during the holiday season Poinsettias can be placed anywhere. However if they are close to outside doors where they will be subjected to drafts they will not survive as well as ones that have a warm location. After the holidays are over move your plant to a more sunny location away from cold drafts. Keep it moist but not wet at all times. Feed it once a week. That’s it. Most plants will keep their red leaves for quite a long period, usually at least two months. I have had some that did not drop their red leaves until spring. When summer comes the plants can be placed outside in a sunny location. Keep watered and they will reward you with lush green foliage. They make wonderful deck plants. Poinsettias can be cut back to keep them busy. However don’t cut the plant back all at one time as it can shock the plant too much. When cutting plants make sure you wear gloves, thin plastic ones are suggested. 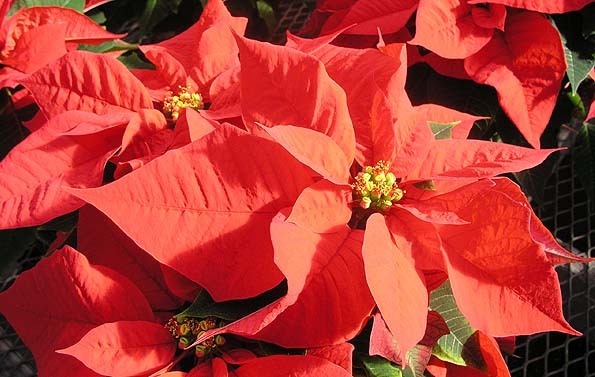 Poinsettias exude a sticky latex that some people find causes skin irritation. Bring the pots back into the house for the winter season. Don’t eat poinsettias or let pets chew on them, the latex can be poisonous. The red ‘flowers’ are of course not really flowers but red leaves or ‘bracts’ the flowers are those little insignificant yellow things in the center. Poinsettias need a specific light/dark cycle before they will flower. It s long days and short nights, which of course is not what we get at Christmas. So don’t expect your Poinsettia to flower next Christmas, it wont. Its going to flower in the summer. Most likely not until the second year you had it since it was forced to flower out of season for the first year. If you have ever driven past a greenhouse all lit up at night before Christmas, this is why. They have to extend the daylight hours to get those Poinsettias to flower for Christmas. Its not natural but its what we want. So unless you can sneak your plant into the greenhouse or put a lamp on it before the holiday season enjoy its flowers in the summer and appreciate its lush green leaves in the winter months.. Previous Previous post: Take care of your trees when putting up Christmas lights. Next Next post: Keep your garden cheerful in winter with silk flowers.